Marjorie writes a cookery page for the ‘Ireland’s Own’ magazine. If you would like a special recipe printed or perhaps you would like to share your favourite recipe of like a request, Marjorie would love to hear from you. Tune into Mid West Radio for “Marjorie’s Kitchen” on the first Thursday every month at 11.30 am on Paul Claffey’s mid-morning show. 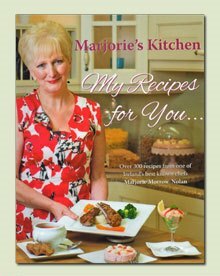 Marjorie will post a copy of any recipe from ‘Marjorie’s Kitchen’ (specially typed and with her own seal of approval!) to any part of the world for a cost of €6.50. Marjorie’s new cookery book, ‘My Recipes for You’, with over 600 recipes, available now to buy on-line. For a special treat why not order a personally signed copy?